Tawharanui is a wonderful place to see birds. Coastal cliffs, open beaches, rocky shores, wetlands, forests and open pasture are all used by birds for feeding or breeding habitat. Removal of mammalian predators and the gradual recovery and restoration of forests and wetlands means that more birds are now living at Tawharanui. Over the past 30 years, over 90 species have been recorded in and around the park or just offshore. 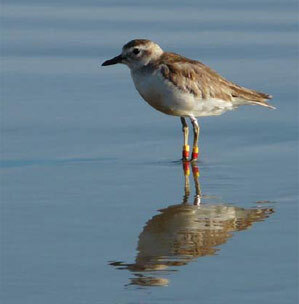 While some species, such as New Zealand dotterel and shining cuckoo, are present in certain seasons, many others can be seen year round. Monitoring bird populations within the Park is an important way of learning about the Tawharanui landscape. TOSSI and the AC monitor all the bird species that are released into the park using radio tracking, direct observation, and nighttime calls (for kiwi). We can tell where the takahe are, whether the kiwi are producing chicks (they are! ), whether pateke are staying in the park (mostly), and how many breeding pairs of robins there are in the Park each year. We also monitor shore birds such as New Zealand dotterel and variable oystercatcher to check on their breeding success from year to year. NZ dotterels are found on sandy beaches and estuaries and were once common in New Zealand but there are now only about 1,700 birds left. Much of this decline is due to habitat loss and predators such as cats, dogs and stoats, so their response to the creation of the open sanctuary is worth watching. "Birds of Tawharanui" produced by TOSSI and printed by ARC provides a checklist of birds you may see in the park. Take this checklist out with you when you next go to Tawharanui.